Against the backdrop of the Gulf rift, Qatar Petroleum (QP), the world’s top liquefied natural gas (LNG) supplier, is moving ahead to boost its LNG production capacity, by adding a fourth line to raise its output capacity from the North Field, from 77 million tonnes to 110 million tonnes/year. This is an increase of around 43%. This move will put the tiny state on a par with top energy exporters in an apparent show of strength amid a protracted political row with its neighbours. Qatar is one of the Organisation of the Petroleum Exporting (OPEC) countries’ smallest producers but is also one of the most influential players in the global LNG market due to its massive output capacity and gas reserves. “Based on the good results obtained through recent additional appraisal and testing, we have decided to add a fourth LNG mega train,” said Saad Sherida Al-Kaabi, the CEO of the state energy giant. For Qatar, which is locked in a dispute with four Arab states, broadening its investments outside the Middle East would cement its position as the world’s largest LNG supplier and help it to weather the boycott with its neighbouring countries of Saudi Arabia, the United Arab Emirates, Bahrain and Egypt. Last year, the countries cut diplomatic, economic and transport ties with Qatar, accusing it of backing terrorism, a charge which Doha denies. Last year, QP said it was planning to develop additional gas from the North Field and build three new LNG mega trains. QP is also in talks with international oil companies for the new expansion project. Oil companies operating in Qatar now include ExxonMobil, Total and Royal Dutch Shell. The company will make a decision on the foreign partners by the end of 2018, QP’s CEO had said. 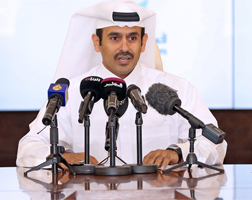 Last year, Qatar lifted a self-imposed ban on the development of the North Field, the world’s biggest natural gas field which it shares with Iran, and announced a new project to develop its southern section, increasing output in five to seven years. The decision to boost its LNG output capacity came after Qatar was in talks to supply pipeline gas to Saudi Arabia and increase supplies to UAE, according to Reuters, but plans to supply the two Gulf nations were halted due to the dispute but QP went ahead anyway with its LNG expansion. The new project announced recently will produce about 32 million tonnes/year of LNG, 4,000 tonnes/day of ethane, 260,000 barrels/day of condensate, and 11,000 tonnes/day of LPG, in addition to approximately 20 tonnes/day of pure helium.